Horrific appearance DC(18) 60ft range if viewed Fort save or lose 1d10 str, 1d8 wis and 1d8 dex for the encounter. Draining Touch DC(19) Fort, At-Will Will, Drain 1-4 points off any ability it chooses and heals 5pts to itself. Frightful Moan DC(14) Will, 1/encounter, 30ft range or be panicked for 1d4 rounds. Dimension Door 1/day, move up to 500' away to a location known by the caster. Wailing Movement DC(10) Will, 15ft range, Blinkfolk use wailing movement automatically if they make a full move action. Targets who fail will panic for 1 turn, and have -2 attack modifier on their next turn after panicking. A Blinkfolk by nature does not trust humanoids, and will attack a humanoid if they come within 60' unless the humanoid exits twice that range in which case they will watch the humanoid adamantly until the humanoid leaves the Blinkfolk's sight. A Blinkfolk will use wailing movement to dissuade a target from approaching. 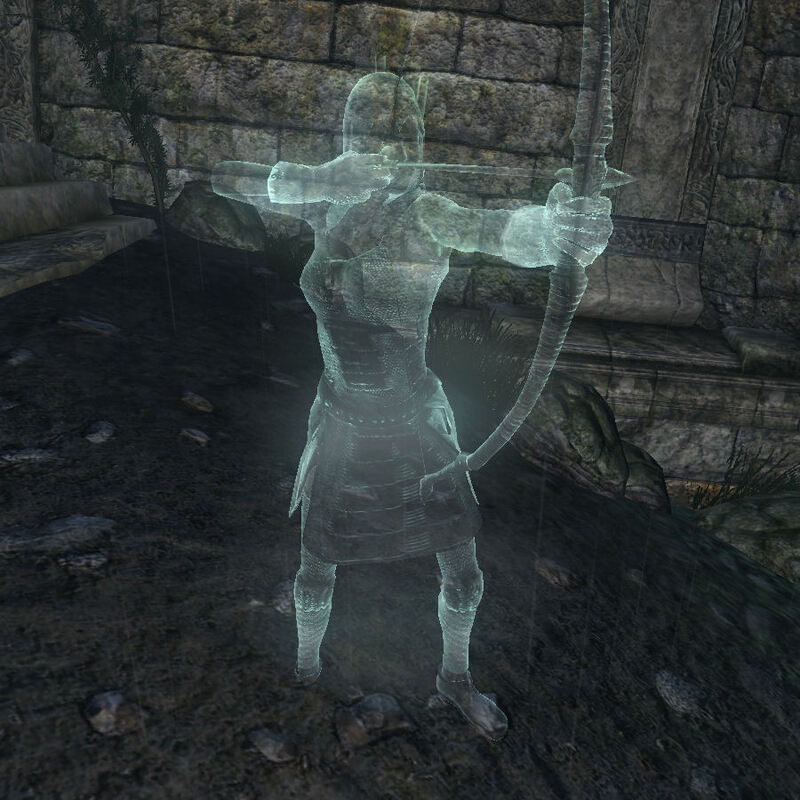 If the target manages to pursue an attack, they prefer to initially use Frightful moan, and then use their bow until the foe perishes or runs away. If melee combat is pursued, they will use Draining Touch again until the foe perishes or runs away. If reduced to one fourth health or less, they will use dimension door to bring themselves to safety. In groups, the scouts will hide behind the rangers until melee combat is pursued by their foes in which case scouts will block for the rangers. Blinkfolk are the children of ghosts and ethereal creatures. Though on rare occasion they are non-humanoid creatures, they are most commonly humanoid, and more often than not fully human in appearance. At first they were just simple rogue like creatures that would wander about. Due to their inability to die because of age, and their durability because of being incorporeal, they began to increase in number. Soon they became small societies, and now in dark forests, their are small to medium sized villages inhabited by Blinkfolk. Blinkfolk societies are small and ungoverned. There is no leader in their villages, however often small groups including a scout and 2 rangers, or 2 scouts with 4 rangers are formed. Outsiders are strictly forbidden in villages, but Blinkfolk may associate with outsiders outside of villages. They are untrusting of others naturally, but outsider friendships are not unheard of. If an outsider attempts to pursue entrance into the village they will be attacked and even possibly by the Blinkfolk friend. Most societies are typically lawless, but general crimes such as murder and theft are not practiced within the societies. However crimes against outsiders don't exist, so theft from an outsider is entirely acceptable among the other Blinkfolk. Usage of currency is typically frowned upon. A Blinkfolk is driven mostly by basic needs, so attempts to bribe a Blinkfolk are unlikely since usage of currency is typically frowned upon. 4 to 12 groups comprised of the 1/2 scout to 2/4 ranger ratio. A Blinkfolk character may be played solo, but such a character will be shunned and potentially attacked if they don't choose to join a Blinkfolk society when encountered. Again, Blinkfolk are skeptical of all non-Blinkfolk characters, so there should be a significant amount of time spent between at least one member of the group and the Blinkfolk character. Advancement is through the ranger class with 1 or 2 levels of rogue.